For some, that may sound like a typical dog training inquiry, without any issues. For me, that raises a red flag and means I need to ask a few more questions. “How does your dog act around strange dogs and people he doesn’t know?” That one question usually gets me to the root of their call. Typically the caller has a dog who is overly fearful of strangers or other dogs, or reacts by lunging and barking. In either case, a basic group dog training class is not typically going to be the right arrangement for this dog and dog guardian. I am so pleased that dog owners want to help their dogs and change their dog’s behavior or fear to something more pleasant and polite. But sometimes I don’t think people that have a dog with “issues” realize that there are other students in class as well. A group dog training class needs to be pleasant for all students involved. And students in class need to be able to act freely and not be worried about upsetting the dog next door. But, even more important than that, I think about the dog who is trying to overcome his issues. If a dog is too stressed or too reactive in class, the class is NOT benefiting him, and he will likely get worse, not better, in that situation. But if a dog is not suited for a group dog training class, how is that dog going to learn to be around other dogs and people? The answer is individual and customized private dog training lessons. The problem with a basic group dog training class and a dog who needs extra attention and extra space is that the instructor’s time is split among the entire class. When a dog parent and dog are learning the basics and foundation skills for dog behavior modification, an experienced dog training coach that can focus solely on the team is extremely beneficial for long-term success. A dog’s behavior and emotions are so fast and change so quickly, it is important to have an experienced coach by the new team’s side to help guide them. In a group dog training class, even a dog reactive class, these beginning steps can be missed, and a dog can be put over the threshold (too much, too quickly) in a blink of an eye. The more a dog is over that threshold, the harder it becomes to change their behavior. Local dog-reactive classes can be very helpful; I even taught them for many years myself. However, when I did teach dog reactive classes, I required three sessions of individual coaching first, and approval before enrolling. This ensured the dog was ready, the owner was ready, and I knew what the team needed in a class environment in order to be successful. On the other hand, private individual dog training allows for total customization to ensure the dog training team is successful every step of the way. Dog training lessons can also be fully orchestrated with the help of volunteers. Even outside dog training outings can be controlled pretty easily with the right dog-friendly locations that take public activity and space into consideration. 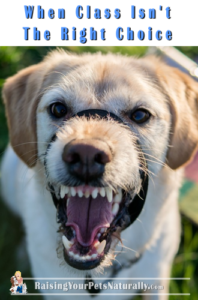 The bottom line is, if you have a dog who is fearful or over-reactive around other dogs or people, do seek professional help from a qualified dog behavior counselor. If you are unsure where your dog fits in, call the dog trainer and speak with them. Explain to the dog trainer how your dog acts and what your goals are. Your dog is counting on you to make the right decision and to follow through with his positive dog training. 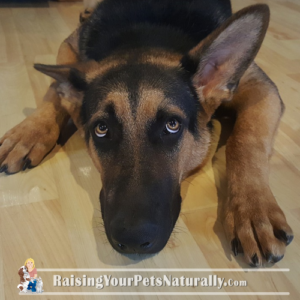 Do you have a fearful or over reactive dog? Tell me in the comments. Yes, I have a dog who socializes well in Colonial Williamsburg and at Dog shows but when we are in the neighborhood she wants to bark and growl at them. I try to say hello first to the walking neighbor that seems to help some but there are times when doesn’t work. What can I do? I am sure it must be a territorial thing.